A swarm is like a human democracy: we listen to candidates promote themselves, then vote for one. A swarm does the same by voting on nesting sites promoted by scouts. Scientists call a honey bee swarm ‘a cognitive entity’: which means it can think. 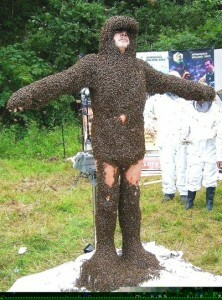 Philip McCabe got swarmed by 200 000 bees to raise money for the charity Bees For Development. 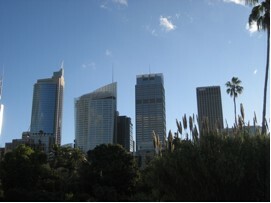 (Photo by Michael Maunsell). In sci-fi movies, scientists create monsters, which escape of course. Something like this happened in Brazil where scientists made aggressive ‘killer’ bees by crossing honey bees from Africa and Europe. 26 killer-queens escaped from the lab and swarms have now spread into North America. Both live in communities; often in high-rise buildings; both have organised work habits; the young of both stay home then go into the world at about 21 (days or years); and both humans and bees are at our best when we cooperate. In fact, the bee genes are more similar to humans than any insect genome studied. Bees are good at mathematics. Scientists gave bees food outside their hive, and then moved the food further away by a regular distance each time. 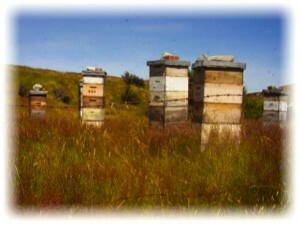 The bees worked out the distance, and the scientists were amazed to find the bees waiting for them at the next feeding spot. Honey bees can also tell time. Scientists trained bees to feed at 10.30am and the bees then turned up at that time every day to wait for a sugar reward. Bees can learn to recognise shapes, including letters. 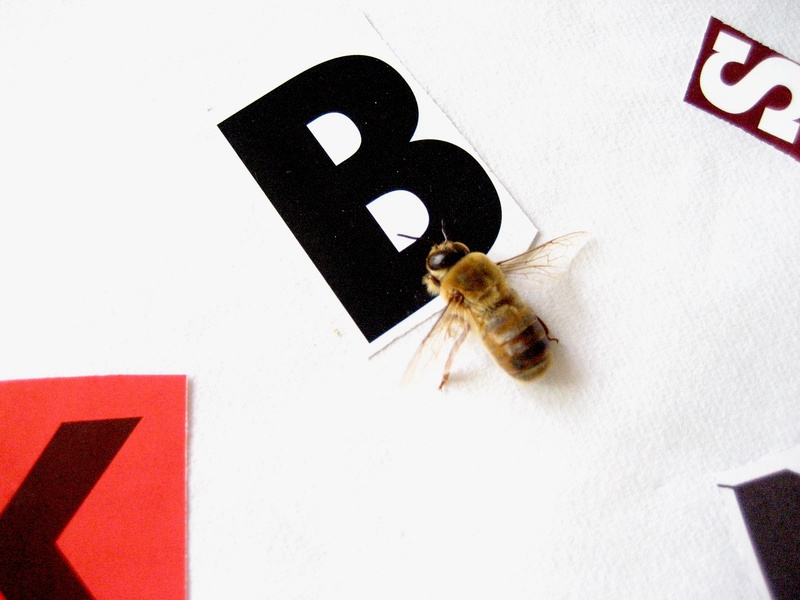 In one test, a bee was able to spot the letter B among other shapes.